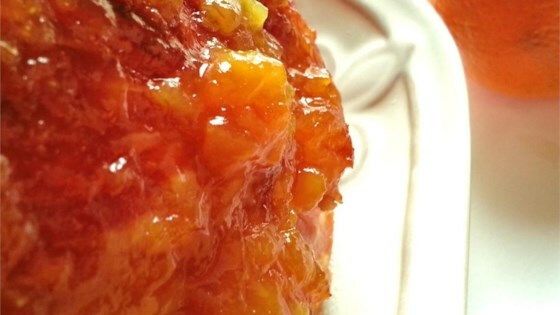 "This is a delish ham glaze that's made with mango chutney and orange juice." Combine brown sugar, garlic, mango chutney, orange zest, orange juice, and mustard in the work bowl of a food processor. Process until smooth. To use glaze, brush on cooked smoked ham, and bake at 350 degrees F for 1 hour. I wanted to edit my review- what I meant by the syrup was the chutney and orange gave it a too sweet candy flavor. Came out delicious. got rave reviews. Instead of the chutney I added apricot preserves. So nummy I want to make this all the time to have for a spread! VERY good Christina! One of the big clubs has spiral ham on sale so I snatched it up. I didn't want to use the packet of glaze it came with so this was the perfect alternative. YUM! Thank you!! Delicious! The only thing I changed was I used apricot preserves because I couldn't find mango chutney. This recipe is a "keeper".. I used Sugar free peach preserves,instead of Chutney. I also use this sauce as a "dipping" sauce for just baked pretzels also. Thanks for sharing this recipe.